We are looking for an experienced Safety Coordinator to help us minimize the risk of job-related accidents. You will monitor operations to eliminate hazardous activities. You will also develop policies to promote occupational health and safety (OSH) awareness. Safety coordinators should be well-versed in all OSH dictations. Your work will be focused on prevention so you need to be diligent and analytical. You will possess a keen eye for detail and a sensitivity for potential dangers. The goal is to support the creation of a healthy and safe workplace. Must have ADP, QuickBooks, General Ledger and Reconciliations. Tax exposure is a plus. We are looking for a Driver to transport clients in a comfortable, safe and timely manner. Driver responsibilities include arranging regular cleaning and maintenance services for the vehicle, planning each route based on road and traffic conditions and managing payments. Ultimately, you will help us increase customer satisfaction, making sure clients depend on us for their transportation needs. To be considered for this role, you should have a valid driver’s license and a clean driving record with no traffic violations. Note that you don’t need to have a car; we provide drivers with our own vehicles. Bring 2 forms of ID and updated resume. Call 805-485-4606 with any questions. Implements human resources programs by providing human resources services, including talent acquisition, staffing, employment processing, compensation, health and welfare benefits, training and development, records management, safety and health, succession planning, employee relations and retention, AA/EEO compliance, and labor relations; completing personnel transactions. Develops human resources solutions by collecting and analyzing information; recommending courses of action. Improves manager and employee performance by identifying and clarifying problems; evaluating potential solutions; implementing selected solution; coaching and counseling managers and employees. Completes special projects by clarifying project objective; setting timetables and schedules; conducting research; developing and organizing information; fulfilling transactions. Manages client expectations by communicating project status and issues; resolving concerns; analyzing time and cost issues; preparing reports. We're looking for a CNC Supervisor/Programmer/Machinist!! 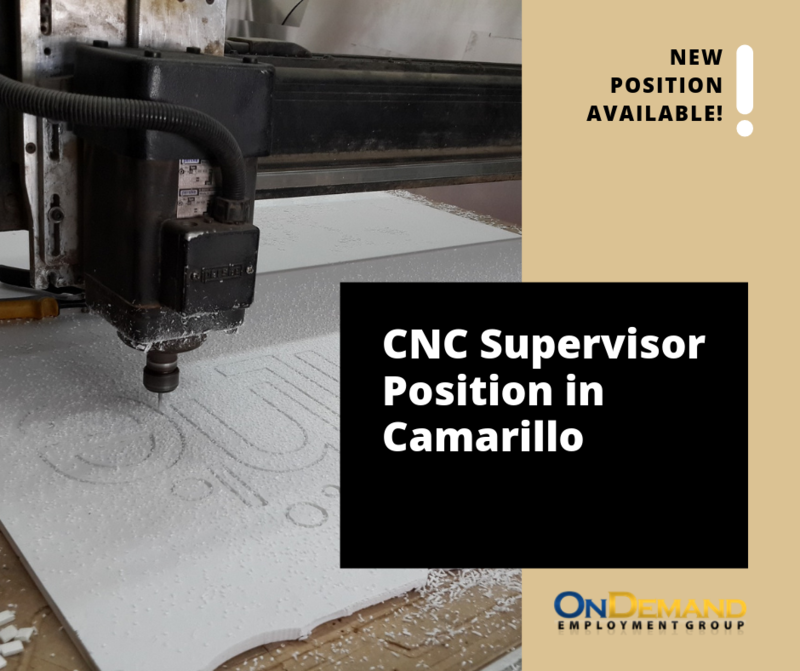 Position is Full-time in Camarillo. Pay is $45-50/HR! Creates CNC programs from Catia models. Modifies, creates designs and translates in a 3-D Catia environment. Coordinates programming for CNC department. Coordinates and schedules machine load. Orders all material and supplies for CNC machine jobs. Operates CNC machines as required. Uses PCMS to inspect finished tools and calibrate inspection fixtures as required. Directs, controls, monitors and provides technical and supervisory guidance to assigned staff. Interfaces with machine and software manufacturers to keep equipment up-to-date and troubleshoot as required. Evaluates performance, performs performance evaluations and recommends salary action for staff. Participates with personnel issues and disciplinary action of assigned staff. Additional responsibilities and projects, as assigned. Must comply with all Company policies, procedures and safety rules. Minimum 3 years experience in Catia programming and minimum 5 years experience on CNC machine. Must be familiar with CMM or PCMS inspection equipment and software. Ability to train employees and interface with all levels of management. Ability to work independently and be dependable. Must be detailed oriented and able to perform multiple concurrent tasks with constant interruptions. Good problem solving and reasoning skills. Must have forklift experience and have the ability to be certified by the Company. Ability to travel to customer facilities, when required. Ability to work a flexible 5/40 work week, maintain regular attendance and be available to work overtime, if needed. Under minimal supervision, sets up and operates manually controlled machines in skilled precision and bench work in the fabrication, maintenance, repair and alteration of machinery, machine parts, tools and equipment. Performs all tasks in a safe and responsible manner. Uses gauges and measuring instruments to meet tolerance requirements. Ability to track parts and jobs into the vantage system. To perform this job satisfactorily, an individual must be able to perform each essential duty satisfactorily. 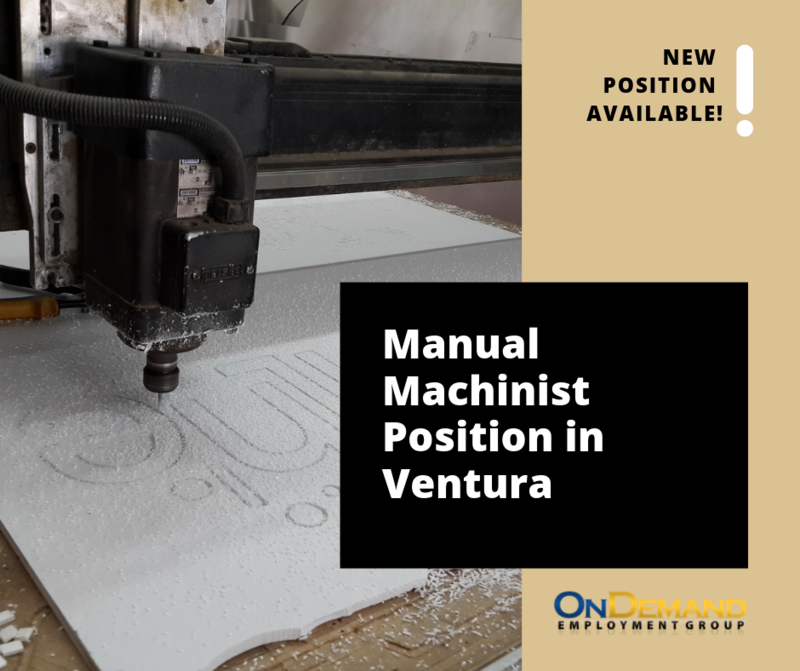 Must have a general knowledge of 1) estimating time and materials for machine jobs, 2) metals and the quality and machinability and uses of metals, alloys and other materials, 3) machines and tools, including their design, uses, repair and maintenance, 4) design techniques, tools and principals involved in the production of precision technical plans and drawings. We are looking for a Driver to transport clients in a comfortable, safe, and timely manner.